Beetnik, an Austin-based organic food company, is drawing on its success to include a new line of organic, artisanal pasta sauces. Hot off the heels of their rapid expansion in the natural frozen category, Beetnik has set sights on expanding their line of organic products to the deli category. Currently boasting twelve organic frozen entrées, Beetnik will be debuting their line of new, organic pasta sauces at the Expo West show in Anaheim, California on March 12th, 2016. 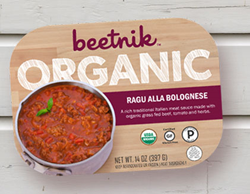 The two sauces, Ragu alla Bolognese & Pollo alla Cacciatora, were inspired by the Beetnik team’s dedication to creating authentic, clean, organic food options with the finest ingredients available. “We are excited about this expansion of the Beetnik line of products and we are committed to offering more choices to fellow Beetniks who are looking for convenient organic products”, explained Beetnik CEO David Perkins. The traditional Ragu alla Bolognese is a rich Italian meat sauce made with organic grass fed beef, tomato and zesty herbs, while the classic Pollo alla Cacciatora includes braised organic chicken and a sauce made from tomato, bell peppers, olives and herbs. Highly versatile and full of flavor, the sauces can be prepared in mere in minutes and paired with pasta or an emerging category of vegetable noodles. http://www.beetnikfoods.com/wholesale/, or stop by Booth #194 at Expo West.